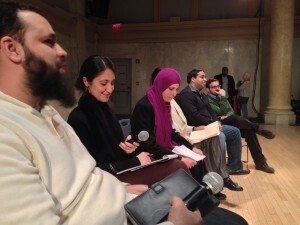 Panelists at the NSJ launch event. Photo by Liliana Segura. This past weekend, activists across the country and around the world marked the 12th anniversary of the arrival of the first prisoners to the U.S. military detention center at Guantanamo Bay. Detainees there have endured numerous forms of torture, including waterboarding, “stress positions,” prolonged solitary confinement, and force-feeding, as well as indefinite detention without trial, and many advocates have pressed for their immediate transfer to the United States and to the federal civilian justice system. But not everyone believes that the torture and injustice will end if Guantanamo shuts its doors. Last Tuesday, members of a new campaign called No Separate Justice held a launch event in New York City. The campaign focuses exclusively on exposing the civil and human rights abuses in “War on Terror” cases prosecuted on American soil–abuses that are almost always directed against Muslims. The campaign will center around four core areas: conditions of confinement (including extreme solitary confinement and deprivation); fair trial and due process concerns (like the classification of evidence held against detainees, even those being charged); First Amendment and material support charges (notably the use of “preemptive prosecution” based on individuals’ perceived political activities or beliefs); and surveillance and entrapment (through “sting” operations that actually persuade individuals to conspire to illegal acts). 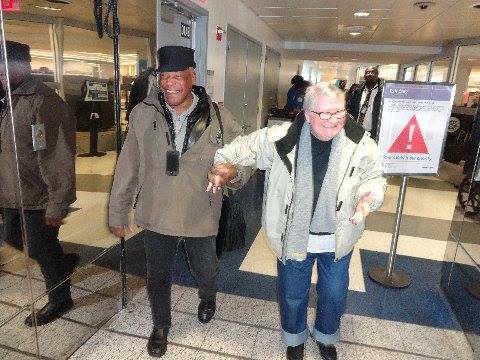 The civil rights attorney Lynne Stewart has returned home from prison after a federal judge ordered her compassionate release. Stewart is 74 years old and dying from late-stage breast cancer. Viewed by supporters as a political prisoner, she had served almost four years of a 10-year sentence for distributing press releases on behalf of her client, Omar Abdel-Rahman, an Egyptian cleric known as the “blind Sheikh.” Stewart arrived to a group of cheering supporters in New York City on Wednesday. Democracy Now!’s Amy Goodman and Renée Feltz were at the airport to cover the homecoming and speak with Stewart about her time behind bars and her plans to continue fighting for political prisoners — and for her own life — now that she’s free. Read the full transcript and view the video here.